I am pleased to announce that the launch date for the Conquest of the Gods Kickstarter will be November 24. I am just ironing out the final details for a few things before the launch date! What can you expect to see from the Kickstarter? We will be launching it with army starter sets for each of the 4 factions. These are a great way to introduce people into the miniatures range and the game. I also think they are comparatively good value when compared with other similar starter sets from the main industry players. 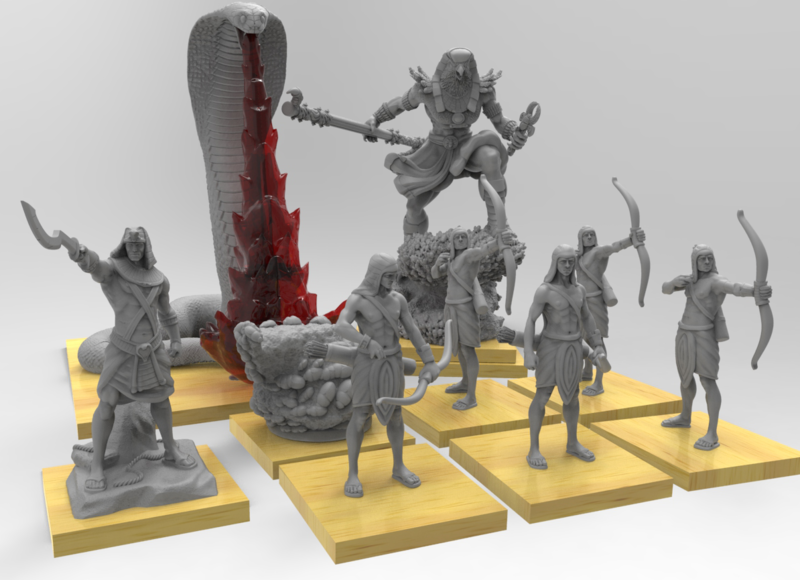 Expansion goals will open up additional units and models to add to your pledge. 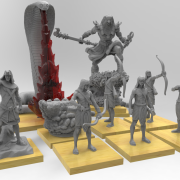 There will be a few free add-ons in the expansion goals but they will largely focus on opening up the models and units that need more funding to get into production. What will each starter set contain? Each starter set will contain 1 god, 1 basic commander, 1 monster (70mm) and a unit of 10 troops, though the number of troops in the Egyptian set is still being worked out due to the increased costs of having Horus in their set (it may mean getting 5 troops and a scarab swarm instead). With the exception of Horus and the monsters, the other models are all 31mm scale. Each miniature will come with a high quality timber base. Where are we up to production wise? The Norse set is being painted by Matt at the moment; the Greek starter set has been moulded and will go to painting before the campaign, I am waiting on a shipment back for a few of the resin parts (notably the blood for Ares spear). The Japanese and Egyptian starter sets are going through moulding over the next few weeks. Some of the resin parts probably won’t be ready in time but I can think I can work around this by showing off the master models. The book is going through editing, and the artwork for all of the starter set units will be completed before the campaign! So we are on track with the book (assuming we generate get enough funding to print it!) the Mini (rules only) version of the book just needs a few art assets and it’s also ready to print off. As always I will leave you with some eye candy, here is a first rendering of the planned contents for the Egyptian starter set.